The cellular service providers in the USA are playing a pivotal role of controlling the business of smartphones. Dubbed as the ‘big four’, Verizon, AT&T, T-Mobile and Sprint hold the lion’s share in terms of customer base. While AT&T and T-Mobile networks are based on GSM (like Europe and Asia, although some networks bands are different), the other two built their infrastructure on CDMA tech. Verizon is phasing out the CDMA layer in favour of gigabit LTE, aiming at a 2020 date to completely turn off the old network. With or without the merger of T-Mobile and Sprint, the latter will continue to support CDMA, at least till 2021. Marcelo Claure is the Executive Chairman at Sprint. Because of this diverse usage of cellular technologies, the US variants of Samsung Galaxy S10 ship with Qualcomm based cellular modem, which can support both GSM and CDMA based networks. Depending on carrier, the appropriate mode is being used. Believe me, things are overly complicated in the USA. Dealing with multiple network modes is not a easy task. 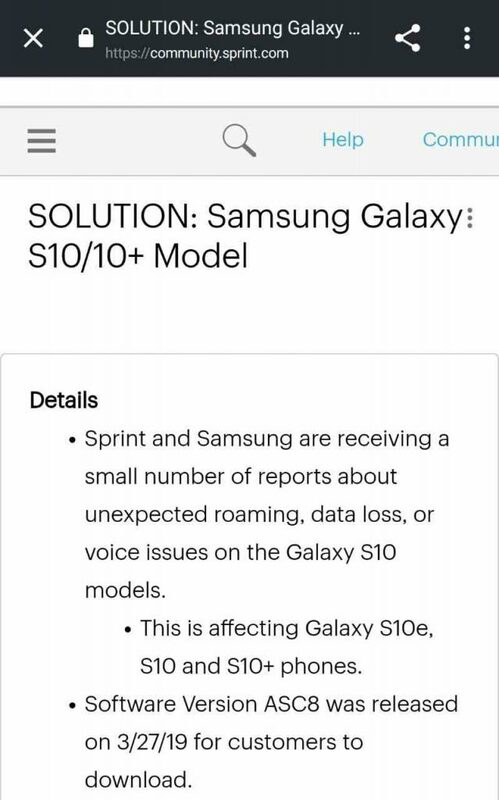 Perhaps that’s the reason behind Sprint Galaxy S10 data / LTE connectivity issues since the beginning of the release of Samsung’s 2019 flagship. 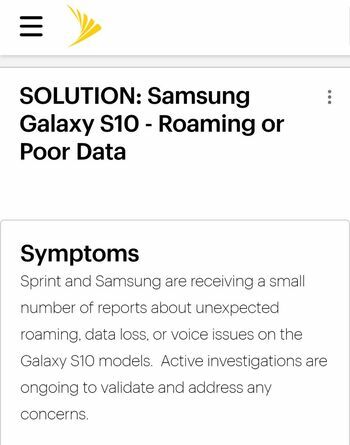 @marceloclaure As a brand new Sprint subscriber , The data issues I'm having with my S10 and s10e are inexcusable. LTE data is virtually unusable, Calls drop over VoLTE . A terrible first impression. Please make this right. A reddit user (u/corys00) with a flair ‘Verified Strategic Accounts Manager – Corporate’ posted that they were already aware of the issue. A new maintenance update should be pushed by Sprint on March 27 to fix the glitches. Frustrated end users discovered some workarounds (like disabling band 41), while Sprint officially acknowledged the issue by posting a KB thread in their forum. TBH, that was not something we should call a proper solution. A new update was eventually pushed by Sprint and Samsung. Carrying the build number of ASC8, the OTA update brought March security patches and typical “device stability improvements and bug fixes”. However, there was no official announcement about the update. In fact, the same build was pushed to global Exynos models, but pulled back and replaced with a new build (ASCA) for undisclosed reasons. The situation became messy, as the customers were still facing network issues – even after upgrading to the new build. In fact, a number of users commented on our article about the bug and mentioned that the update was not helpful for resolving the issues. The update did NOT fix my data issues. In fact, it made them worse. Phone was “mostly” working prior to, not I can’t get any LTE signal. Fortunately, Sprint has shared a new knowledge base article in their community forum a few hours ago. First of all, they have actually confirmed that build ASC8 is the network fix. On the other hand, they have admitted the chance of potential hardware faults in some units. Affected users need to be on ASC8 build before going for RMA. An official statement is certainly helpful to clear up the confusions. Paying a thousand bucks for a phone that can not get proper data connection is utterly meaningless. 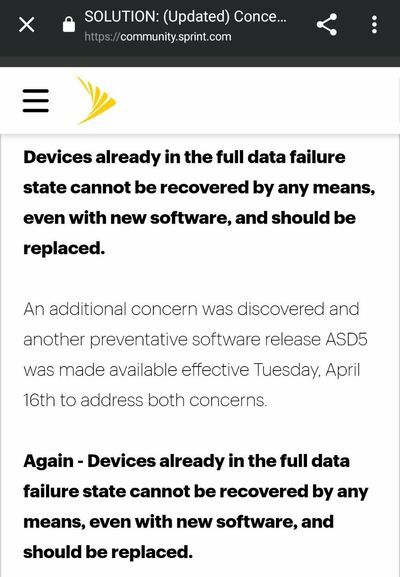 Hopefully Sprint customers will get replacement of their faulty phones ASAP.